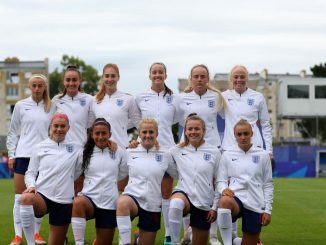 A stoppage-time leveller from Brazil denied England a second straight win at the Under 20 Women’s World Cup after a hard-working performance looked to be enough to seal the three points reports RICH LAVERTY, from Dinan-Léhon. Georgia Stanway’s sole penalty after just eleven minutes looked to be enough in a performance where Mo Marley’s side saw themselves throwing bodies on the line to keep out the threat of Brazil. 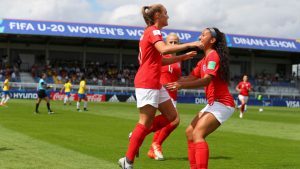 But substitute Ariadina Borges fired home from the edge of the box two minutes into stoppage time to rescue a point for Brazil and break England’s hearts. Marley made one change to the team that beat Korea DPR on Sunday with Birmingham’s Charlie Wellings replacing Lauren Hemp up front. 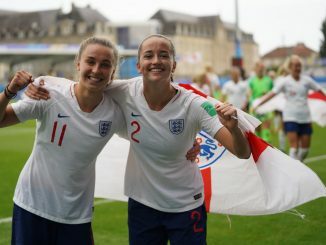 The breakthrough came early on when Tainara was adjudged to have pulled back Chloe Peplow from a free-kick and Stanway calmly stepped up to smash her penalty into the top corner, as she did against the same opposition two years ago at the Under 17 Women’s World Cup. From then on England would largely find themselves having to put in a ‘backs to the wall’ performance as Brazil desperately tried to save their campaign (they lost 3-2 to Mexico in their opening fixture). Right-back Monalisa had the best chance of the first half when she hit her effort straight at Sandy MacIver, a feat the South Americans would repeat several times. Brazil established increasing pressure as the second half wore on and England struggled to get out of their own half. 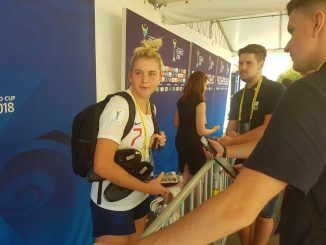 Kerolin, the star of Sunday’s match against Mexico, was again a real livewire with her runs at the England defence but she fired over from a good position before Geyse shot straight at MacIver when through on goal. 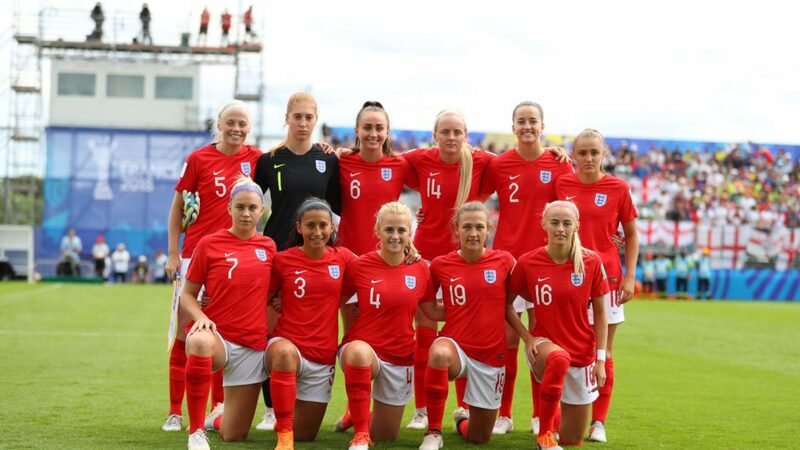 England looked to have sealed it when Anna Patten headed home Alessia Russo’s corner with twenty minutes to go, the goal however disallowed seemingly for substitute Lauren Hemp being in an offside position in front of the goalkeeper. 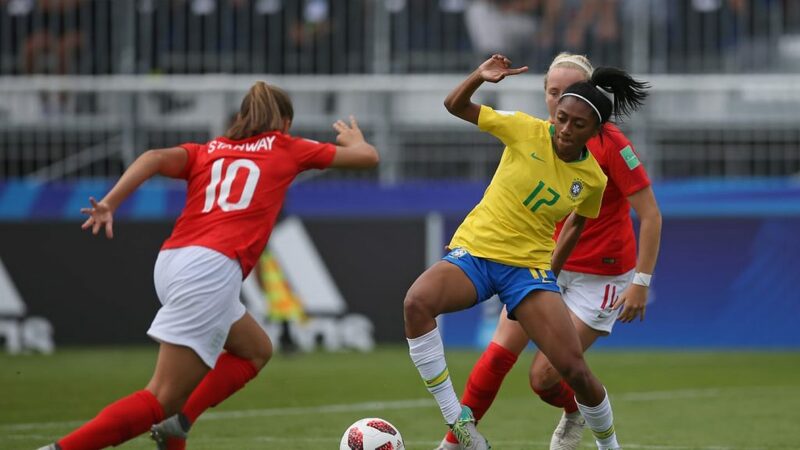 Brazil’s biggest chance came when Tainara could only stab her effort from point-blank range straight at MacIver, while England should have put the result beyond doubt when Chloe Kelly released Stanway, but the midfielder could only hit her effort straight at an on-rushing Kemelli. It was a chance England would rue in stoppage time. Kerolin’s quick feet opened up an opportunity and Ariadina’s snapshot from the edge of the box crept past MacIver to salvage Brazil’s campaign.